The 3-day annual cultural extravaganza conducted by Gargi College played host to enthralling competitions and star-studded events which drew curtains on its golden jubilee celebrations this year. Reverie, Gargi College’s annual cultural fest was hosted from 14th to 16th February 2017. This year was a special year for Gargi College as it celebrated its golden jubilee year. Hence the theme for the fest was decided as ‘a fiesta for renaissance’. There are events which do not kick start but rather simmer and build up. The first day of Reverie 2017 reached its crescendo on similar lines. It started on a high note with the inaugural speech given by Ratna Pathak Shah, a beloved TV and film actress who is best known for her role as Maya Sarabhai in the popular TV show, Sarabhai vs Sarabhai. In her speech, she spoke about the importance of art, culture, theatre and cinema in our socially and politically heated times. She set the perfect precursor to the day ahead, sharing her experiences as a student and the role of competitions in shaping lives. Ratna Pathak Shah inaugurates Gargi College’s Annual Cultural Fest, Reverie 2017. Watch this space for live updates! Picture Credits- Gerush Bahal for DU Beat. Moving on, the day played host to popular competitive events like Saptak, the duet singing competition, Dhanak, the folk dance competition, Khayal, the solo singing competition and Zenith, the western dance competition. The reverberations of the first day of the 3-day extravaganza at Reverie 2017 ended with the epic bacchanalia at the main stage. The performance of Bismil had the audience mesmerised as they covered popular Bollywood numbers. Day 2 of Reverie began on a melodious note by Samranjini, the Indian choir music competition. Following this, the power packed nukkad natak competition, Aabhaas was held by Kshitij, the Hindi theatre society of Gargi College. 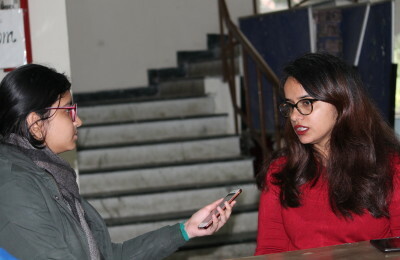 The day also featured events like the ad making competition held by Cinematrix, the film making society of the college and Reverie Idol, the Hindi solo singing competition. Next up in the line was the English stage play completion, Nivacanna, hosted by Gargi College’s stage play society, Upstage. The event was then succeeded by the highlight of Day 2, presence of actress and model Urvashi Rautela’s, an alumuna of Gargi College. As the evening set in, the crowd danced to the EDM duo of Sunny Sharma and Karan Bhalla, known by their stage name, Progressive Brothers. Pumping up the crowd with their electrifying tunes, the Progressive Brothers (@progressivebrothers )was LIVE and wrapped up Day 2 at Reverie, Gargi College’s Annual Fest! Picture Credits- @kartikkher for DU Beat. Day 3 at Reverie, the annual cultural fest of Gargi College, kicked off with enthralling performances in the western acapella competition by various western music societies across Delhi University. The day continued with the western duet competition and the western solo competition. Following these events, Reverie 2017 took a star studded turn when RJ Khurafati Nitin from Fever 104 also came to the fest as a speaker for an event. He promoted his new talk show At Fever 104 and made the audience laugh with his sketch. The next event was Cursive-iti, which was the western choreography competition, which saw nine participating groups from various colleges. Sanya Malhotra, who played Babita Phogat in the Aamir Khan starer Dangal, and an alumnus of Gargi College, graced the stage of her alma mater with co-star Aparshakti Khurana. The two actors danced to hits like Dhaakad and London Thumakda and answered questions from their fans.